Lao, sometimes referred to as Laotian (ລາວ Lao or ພາສາລາວ Lao language), is a Kra–Dai language and the language of the ethnic Lao people. It is spoken in Laos, where it is the official language, as well as northeast Thailand, where it is usually referred to as Isan. Lao serves as a lingua franca among all citizens of Laos, who speak approximately 90 other languages, many of which are unrelated to Lao. Modern Lao (language) is heavily influenced by the Thai language. A vast number of technical terms as well as common usage are adopted directly from Thai. Like other Tai languages, Lao is a tonal language and has a complex system of relational markers. [clarification needed] Spoken Lao is mutually intelligible with Thai and Isan, fellow Southwestern Tai languages, to such a degree that their speakers are able to effectively communicate with one another speaking their respective languages. These languages are written with slightly different scripts but are linguistically similar and effectively form a dialect continuum. Although there is no official standard, the Vientiane dialect has become the de facto standard language in the second-half of the 20th century. Due to Han Chinese expansion, Mongol invasion pressures, and a search for lands more suitable for wet rice cultivation, the Tai peoples moved south towards India, down the Mekong River valley, and as far south as the Malay Peninsula. The oral history of the migrations is preserved in the legends of Khun Borom. Tai speakers in what is now Laos pushed out or absorbed earlier groups of Austroasiatic and Austronesian languages. Vientiane Lao Vientiane, Vientiane Capital Prefecture, Bolikhamsai Nong Bua Lamphu, Chaiyaphum, and parts of Nong Khai, Yasothon, Khon Kaen, and Udon Thani. Northeastern Lao/Tai Phuan Xiangkhouang and Houaphanh. Parts of Sakon Nakhon, Udon Thani. Central Lao Savannakhet and Khammouane. Mukdahan and parts of Sakon Nakhon and Nong Khai. In addition to the dialects of Lao, numerous closely related languages (or dialects, depending on the classification) are spoken throughout the Lao-speaking areas of Laos and Thailand, such as the Nyaw people, Phu Thai, Saek, Lao Wiang, Tai Dam, and Tai Daeng. These Tai peoples are classified by the Lao government as Lao Loum (ລາວລຸ່ມ, láo lūm) or lowland Lao. Lao and Thai are also very similar and share most of their basic vocabulary, but differences in many basic words limit inter-comprehension. The Lao language consists primarily of native Lao words. Because of Buddhism, however, Pali has contributed numerous terms, especially relating to religion and in conversation with members of the sangha. Due to their proximity, Lao has influenced the Khmer and Thai languages and vice versa. Formal writing has a larger number of loanwords, especially Pali and Sanskrit, much as Latin and Greek have influenced European languages. For politeness, pronouns (and more formal pronouns) are used, plus ending statements with ແດ່ (dǣ [dɛː]) or ເດີ້ (dœ̄ [dɤ̂ː]). Negative statements are made more polite by ending with ດອກ (dǭk [dɔ᷆ːk]). The following are formal register examples. ຂອບໃຈຫຼາຍໆເດີ້ (khǭp chai lāi lāi dœ̄, [kʰɔ᷆ːp t͡ɕàj lǎːj lǎːj dɤ̂ː]) Thank you very much. ຂ້ານ້ອຍເຮັດບໍ່ໄດ້ດອກ (khānǭi het bǭ dai dǭk, [kʰa᷆ːnɔ̂ːj hēt bɔ̄ː dâj dɔ᷆ːk]) I cannot. ໄຂປະຕູໃຫ້ແດ່ (khai pa tū hai dǣ, [kʰǎj pa.tùː ha᷆j dɛ̄ː ]) Open the door, please. Lao syllables are of the form (C)V(C), i.e., they consist of a vowel in the syllable nucleus, optionally preceded by a single consonant in the syllable onset and optionally followed by single consonant in the syllable coda. The only consonant clusters allowed are syllable initial clusters /kw/ or /kʰw/. Any consonant may appear in the onset, but the labialized consonants do not occur before rounded vowels. One difference between Thai and Lao is that in Lao initial clusters are simplified. For example, the official name of Laos is Romanized as Sathalanalat Paxathipatai Paxaxon Lao, with the Thai analogue being Satharanarat Prachathipatai Prachachon Lao (สาธารณรัฐประชาธิปไตยประชาชนลาว), indicating the simplification of Thai pr to Lao p.
Only /p t k ʔ m n ŋ w j/ may appear in the coda. If the vowel in the nucleus is short, it must be followed by a consonant in the coda; /ʔ/ in the coda can be preceded only by a short vowel. Open syllables (i.e., those with no coda consonant) and syllables ending in one of the sonorants /m n ŋ w j/ take one of the six tones, syllables ending in /p t k/ take one of four tones, and syllables ending in /ʔ/ take one of only two tones. The Lao script, derived from the Khmer alphabet of the Khmer Empire in the 14th century, is ultimately rooted in the Pallava script of South India, one of the Brahmi scripts. Although the Lao script bears resemblance to Thai, the former contains fewer letters than Thai because by 1960 it was simplified to be fairly phonemic, whereas Thai maintains many etymological spellings that are pronounced the same. The script is traditionally classified as an abugida, but Lao consonant letters are conceived of as simply representing the consonant sound, rather than a syllable with an inherent vowel. Vowels are written as diacritic marks and can be placed above, below, in front of, or behind consonants. The script also contains distinct symbols for numerals. The Lao liturgical script is written in the Tai Tham script and is still used in temples in Laos and Isan. A silent ຫ (/h/) placed before certain consonants will produce place the other proceeding consonant in the high class. This can occur before the letters ງ /ŋ/, ຍ /ɲ/, ຣ /r/, and ວ /w/ and combined in special ligatures (considered separate letters) such as ຫຼ /l/, ໜ /n/, and ໝ /m/. In addition to ອ່ (low tone) and ອ້ (falling tone), there also exists the rare ອ໊ (high) ອ໋ (rising) tone marks. ^ "Lao (Laotien)". Inalco. 20 January 2017. ^ Hammarström, Harald; Forkel, Robert; Haspelmath, Martin, eds. (2017). "Lao". Glottolog 3.0. Jena, Germany: Max Planck Institute for the Science of Human History. ^ "Lao | About World Languages". aboutworldlanguages.com. Retrieved 2016-05-25. ^ "Ausbau and Abstand languages". Ccat.sas.upenn.edu. 1995-01-20. Retrieved 2012-07-08. ^ Northern Lao is also spoken in large parts of Uttaradit Province and Phitsanulok, which are outside the Isan region. ^ Northeastern Lao is sometimes considered a separate language, as it is traditionally spoken by Phuan tribal members, a closely related but distinct Tai group. Also spoken in a few small and scattered Tai Phuan villages in Sukhothai, Uttaradit, and Phrae. ^ Southern Lao gives way to Northern Khmer in Sisaket, Surin, and Buriram, and to Khorat Thai and, to some extent, Northern Khmer in Nakhon Ratchasima. 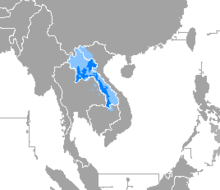 ^ The Western Lao dialect is not spoken in Laos. ^ a b c d e Blaine Erickson, 2001. "On the Origins of Labialized Consonants in Lao". Analysis based on L. N. Morev, A. A. Moskalyov and Y. Y. Plam, (1979). The Lao Language. Moscow: USSR Academy of Sciences, Institute of Oriental Studies. Accessed 2009-12-19. ^ Blaine Erickson, 2001. "On the Origins of Labialized Consonants in Lao". Analysis based on T. Hoshino and R. Marcus (1981). Lao for Beginners: An Introduction to the Spoken and Written Language of Laos. Rutland/Tokyo: Tuttle. Accessed 2009-12-19. ^ a b UCLA International Institute, (n.d.). "Lao" Archived 2010-12-30 at the Wayback Machine. Accessed 2010-07-27. ^ a b Unicode. (2019). Lao. In The Unicode Standard Version 12.0 (pp. 635-637). Mountain View, CA: Unicode Consortium. This page was last edited on 23 April 2019, at 12:21 (UTC).